A worldwide survey* of 196 organizations by Gartner, Inc. showed that 91 percent of organizations have not yet reached a "transformational" level of maturity in data and analytics, despite this area being a number one investment priority for CIOs in recent years. 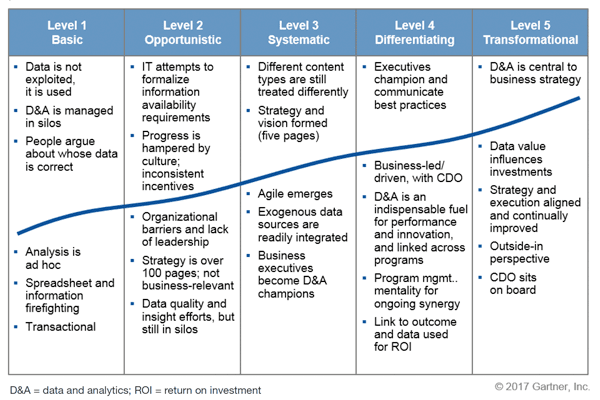 The global survey asked respondents to rate their organizations according to Gartner's five levels of maturity for data and analytics (see Figure 1). It found that 60 percent of respondents worldwide rated themselves in the lowest three levels. "Don't assume that acquiring new technology is essential to reach transformational levels of maturity in data and analytics," said Mr. Heudecker. "First, focus on improving how people and processes are coordinated inside the organization, and then look at how you enhance your practices with external partners." "It's easy to get carried away with new technologies such as machine learning and artificial intelligence," added Mr. Heudecker. "But traditional forms of analytics and business intelligence remain a crucial part of how organizations are run today, and this is unlikely to change in the near future." Organizations reported a broad range of barriers that prevent them from increasing their use of data and analytics. There isn't one clear reason; organizations tend to experience a different set of issues depending on their geography and current level of maturity. However, the survey identified the three most common barriers as: defining data and analytics strategy; determining how to get value from projects; and solving risk and governance issues. "These barriers are consistent with what Gartner hears from client organizations who are at maturity levels two and three," said Jim Hare, research vice president at Gartner. "As organizational maturity improves to enterprise level and beyond, organizational and funding issues tend to rise." "Where the analytics workloads run is based a lot on where the data is generated and stored. Today, most public cloud workloads are new and we won't see the percentage of cloud use rise until legacy workloads migrate en masse," said Mr. Hare. "This scenario will happen eventually, but given the extent to which modern data and analytics efforts overwhelmingly use traditional data types stored on-premise, this shift will likely take several years to complete." *This research was conducted via an online survey in the second quarter of 2017 among Gartner Research Circle members — a Gartner-managed panel composed of IT and business leaders — as well as an external sample source. In total, 196 respondents from EMEA, APAC and North America completed the survey. Respondents spanned 13 vertical industry categories, and revenue categories from "less than $100 million" to "$10 billion or more." Gartner clients can read more in the report "Survey Analysis: Traditional Approaches Dominate Data and Analytics Initiatives."